For a bulk liquid carrier company to establish a legacy in this competitive industry, it has to exhibit the type of attention to detail that sets it apart from its competitors. Multiple companies are constantly striving to break new ground, yet there are fundamental components that are required for any specific experienced business to reach this lofty level. Some bulk liquid carriers have carved out a specific niche that has allowed them to consistently deliver certain items on a regular basis. However, that doesn’t do much good if a customer has items which have specific temperature considerations that need to be followed or are limited in the options for that delivery. 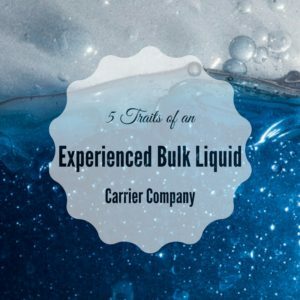 An experienced company that deals with bulk liquid shipments should be versatile enough to have a solid grasp of all aspects of this unique area. That means knowing how to address issues related to dairy and alcohol products while also taking into consideration important religious factors like the rules involving Kosher-certified products. Companies that rely simply on one mode of delivery or don’t look to innovate are usually relegated to also-ran status if they’re able to stay around. Businesses with a clear track record in the bulk liquid carrier industry know that a one-size-fits-all mentality won’t cut it in the 21st Century. That means that looking beyond the idea of just delivering some bulk liquid products by way of refrigerated trucks. Shipping over-season and innovations in the area of tanks has allowed for more viable delivery alternatives. Meanwhile, items like Flexi Tank or Wine Pac offer the opportunity to offer more convenient and environmentally-sound methods that can help with respect to space considerations. The contemporary business landscape requires all companies to look at things through the prism of the international market. That means an experienced bulk liquid carrier can’t expect to compete when their base of operations covers only a small geographic area or even just the United States. Companies that have established relationships with international companies or have experience in delivery of domestic bulk liquid products overseas are those that continue to thrive. Given the fact that continued population growth and the efforts of developing nations will only continue to grow, this is a vital area that can help increase market share. Having a pulse on exactly where a product is helps a carrier and their customer stay informed. This allows proper planning on the estimated time of arrival and can also indicate the presence of a potential problem. Companies that know their way around this business should not only be using state-of-the-art technology to handle such tracking but also keeping track of current trends on the horizon. Peace of mind for their customers is something that’s a distinct part of these companies’ overall business plan. While this should be a core philosophy of any business within the industry, the fact is that some companies are content to cut corners in order to save money or time. This might mean that such things as the strict rules in place for the aforementioned Kosher products aren’t followed or routine maintenance on trucks is skipped. For experienced carriers, it’s second nature to make sure that such rules are scrupulously followed. That level of integrity is why they’ve lasted as long as they have and why customers continue to put their faith in such service. All of the above traits are evident when looking at Kan-Haul for delivery consideration. We’ve served as a bulk liquid carrier company for almost three decades and make sure that our customers receive the very best service possible. Contact us today to handle your bulk liquid needs.